In S4 League players create their own avatar characters and go head-to-head in first person shooter battles for an extreme form of entertainment set in the future; contenders fight each other to the death for money, glory and reputation. The game itself is completely free to play with some premium purchase options and is an action packed MMO with explosive combat, exceptional graphics and exciting gameplay through a number of different game modes and player customisation. The four S’s in S4 League stand for Shooting, Style, eSper and Sport. The Shooting focuses on the fact that this is a shooter game where players can mix up various weapons and skills to perfect their own customised combinations to try and give themselves an edge over other players. Style allows players to customise the look of their character with a score of different outfits and available acrobatics to win over the crowd in battle and create a unique identity for your combatant. ESper refers to the supernatural abilities that these fighters are able to touch upon which they can use to create tactical manoeuvres when fighting for their teams in the arena. 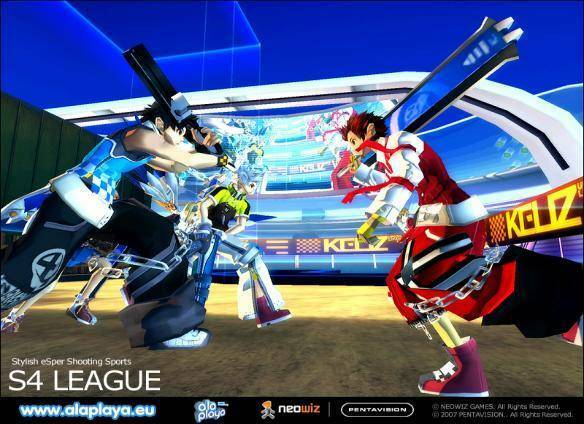 Sport signifies the numerous events and game modes that players can choose from in this competitive MMO. Two main classic game modes available in S4 League are Team Deathmatch and Touchdown. In the Team Deathmatches players can fight 6 to a team and must work to being the first team to earn a set total of points or whoever has the most when the timer has run down. One of the main feature of the battlefield that various objects and elements in the game environment can be destroyed giving an extra tactical element to the game. Touchdown is a classic capture flag type mode where the “fumbi” ball starts at the centre of the field and both teams will try to get it into the other teams goal area. The exciting elements to this game mode is that while in possession of the fumbi a player will lose their SP and can’t use their skills until they no longer have possession. Character customisation centres around the flare and style choices of the players costumes with a number of different clothing items and accessories available, from shirts, pants, gloves, shoes and head were, each of which give bonuses to the character. Players can also arm themselves with a wide selection of weapons and skills to further make their challenge unique; weapons are acquired with a licence that gives the player temporary access to a weapon before it disappears.